Are you sick of the whole chocolates-and-flowers thing for Valentine’s Day? 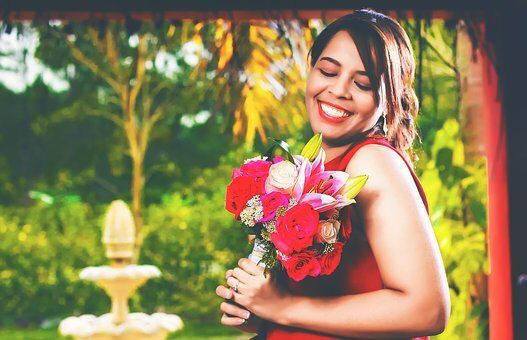 Here are some interesting and quirky traditions from around the world to help spice up your Valentine’s Day. It’s only fitting to start with the country of love. True to its romantic reputation, Valentine’s Day in France is reserved for lovers (or wannabe lovers) only. So unlike in countries like the US and Australia, you don’t tend to get 5-year-olds handing Valentines out to their family, friends and classmates – unless they are very very brave, that is! The French once had a custom called ‘une loterie d’amour’ (love lottery) where unmarried people congregated in houses facing each other and called out the names of their desired partners through the windows. Any man who had the gall to reject the woman would have his image thrown into a huge bonfire alongside hurls of abuse. Unfortunately, this practice has now been banned by the government. Some single Italian gals follow the rather interesting Valentine’s Day tradition of waking up before sunrise to spot their future husband. The belief is that within a year, they would marry the first man they saw on Valentine’s Day, or at least someone who strongly resembled him. This sounds like a rather fun – and lazy – way to find love. However, exercise caution with this technique if you live near lots of senior citizens, or if you have a tendency to drunkenly bring home Nightclub Neddies whose charms are considerably dimmed by the harsh light of sobriety. When you call your husband a pig, it’s not generally intended as a compliment. However, on Valentine’s Day in Germany, expect to see lots of pig-inspired gifts and chocolates. Why? Because pigs symbolise luck and lust, which go rather nicely with the romantic holiday. 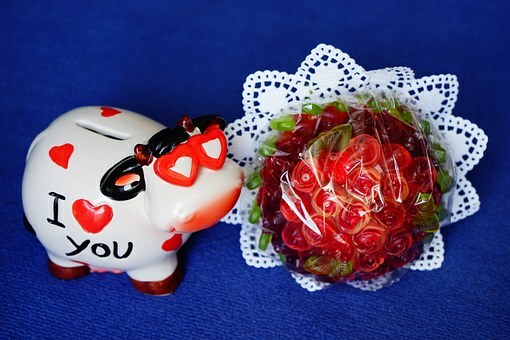 Given that this year is also Year of the Pig in the Lunar calendar, it’ll be interesting to see whether pig paraphernalia will feature more prominently in Valentine’s Day 2019. Stepping away from countries in which Valentine’s Day is strictly about romantic love, places like Finland and Estonia also celebrate friendship on this day. You can send cards and gifts to someone whose friendship you value. In Japan, the ladies give the men in their lives chocolate on Valentine’s Day. Which sounds all nice and diplomatic until you realise that the type of chocolate they give has enormous meaning. Honmei-choco (“true feeling” chocolates) – these high-quality chocolates are hand-delivered to husbands, boyfriends or crushes. 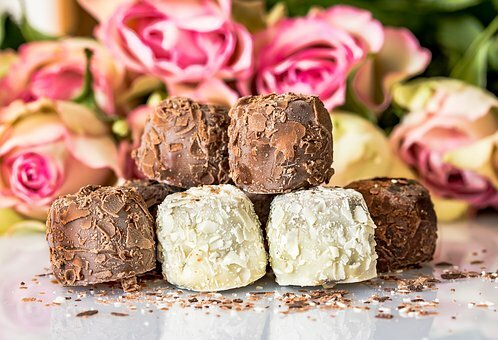 Giri-choco (“obligation chocolate”) – these chocolates are given to male acquaintances and work colleagues. Cho-giri-choco – the poor recipients of these “mega-obligation chocolates” are considered the lowest of the low, with the chocolate signalling that they haven’t even made it into the friend zone, let alone anywhere better. A month later, on White Day, those who received honmei-choco are expected to return the favour by giving their loved ones presents worth 2-3 times the chocolates they received. This usually takes the form of jewellery and lingerie. Ghana is one of the world’s largest cocoa-producing countries. So in 2007, the government decided to declare 14 February National Chocolate Day in a push to increase tourism. I very much approve of this approach. Why suffer under the pretense that Valentine’s Day is all about love and friendship when it should be all about chocolate? China has a festival called Qi Xi which is similar to Valentine’s Day and falls in the seventh lunar month (usually August). While Qi Xi celebrates the lovers, it’s also a time for girls and young women to ‘beg’ for skills (particularly in relation to sewing and other domestic skills) as these are the pathway to love. Common festival activities include threading a needle in the evening light and carving fruit into pleasing shapes. I wonder if you can beg for a husband with domestic skills? Some young South Africans will pin the name of their beloved on their sleeve. This could include their current beau or someone they wish to know better. Not terribly private but possibly very effective! I recently glimpsed an article somewhere saying that 80% of Taiwanese women lose their virginity on Valentine’s Day. In an attempt to verify this claim (because I’m nothing if not a consummate professional – geddit? 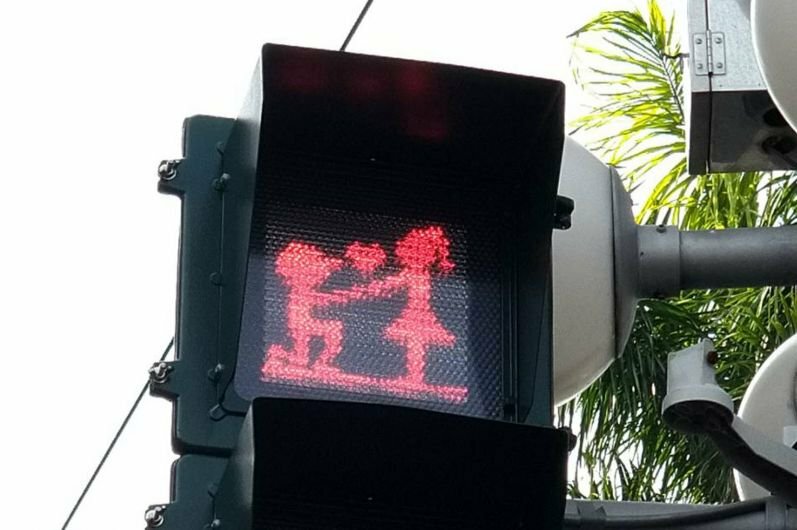 ), I came across this cute pic of special Taiwanese Valentine’s Day traffic lights. Note: I didn’t manage to find a scientific article backing the 80% stat. Though my search history now looks rather questionable.